My goodness these two weeks seem to come round so quickly! Well it's the weekend so naturally it is raining but just that horrible drizzle - "sea fret" as we called it in the north east. I would much rather have a good old downpour. Hope you are all fit and well. My goodness these two weeks seem to come round so quickly! This card is not due until tomorrow but I have another card topost then so su usual I am posing a day early. Lorraine has chosen our theme this week and it is snowmen. I really like this backing paper which actually I felt didn't need anything adding to it apart from the gems. A very simple, flat card. My purse will appreciate all these flat cards when it comes time tobuy the stamps!! A lovely card - a beautiful LOTV topper and I really like the backing paper you've used too. Gorgeous card Christine. You are right the backing paper is lovely and needs nothing. Love the topper. A very cute card, love it. 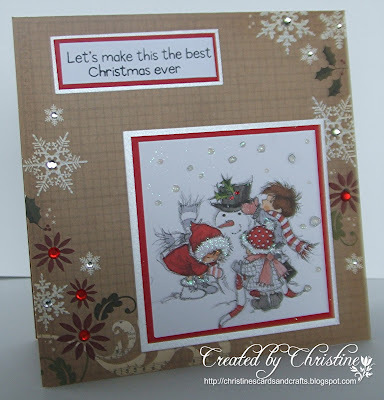 This is so gorgeous, love the snowflakes and the cute image you have used beautiful design, thank you for sharing this with us at Sparkles Christmas, hope to see you next time..
Love these LOTV toppers, such a shame they are no longer available. Your card is gorgeous and I love the backing paper too, don't know how you managed to cut in to it - I have lots of stroking only papers, lol. Oh yes a big thumbs up for that backing paper. It looks great with the added gems. As you say nothing else needed. Love the cute LOTV image you have chosen too. Managed to get mine made in the end. If your going to be late then might as well make it late!! hugs Mrs A.
Hi Christine, this is a lovely card. I really like how you have added some sparkle to that cute image and your card design is beautiful. I love that design paper. Thank you for joining in the fun with us this time at A Gem of a Challenge. I'm catching up again as....you've guessed it, been an NHS inmate again! The backing paper is stunning and with the lovely topper makes for a wonderful card. Been a lovely day here today. Fabulous DP used for the backing of this lovely card. The LOTV topper is beautiful and the mixed red and clear diamonds on the backing paper give the perfect finishing touch. Great card - love the foliage on the kraft card.